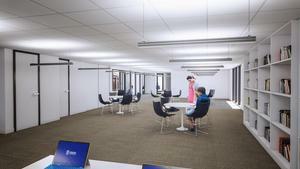 Click "Read full story" to learn more about the new Student Learning Center. A virtual tour is available of the proposed new space which will include a collaborative technology center, a school library, and a multipurpose community space! The 2018-2019 school year marked a new stepping point in the history of Veritas Christian Academy. The school released its five-year strategic plan - A Foundation for Life - in early 2018 which outlined four key goals to enhance the Veritas experience as we step into the future. The four areas of improvement include enhancements to programs and curriculum, transformation to the campus and facilities, maintainence of its financial sustainability, and the continued development of our faculty. The four areas of improvement include enhancements to programs and curriculum, transformation to the campus and facilities, maintainence of its financial sustainability, and the continued development of our faculty. In fall 2018, Mr. Sewell began “A Foundation for Life” meetings outlining the second goal of the Strategic Plan which focuses specificially on the transformation of the campus and facilities. We have already raised $30,000 toward the new Student Learning Center. This year’s Auction will focus on raising the additional funds in an effort to complete our facility enhancement goal.